1. Pull skin back with your thumb and gently push back the cuticle with a pusher. This will release the dead cuticle off the nail plate. Start in the left corner using Erica’s ATA Sciver bit at about 10,000 RPM in reverse mode (RPMs will vary depending on e-file and skin type). Pull the skin back and trace the cuticle with the round safety top, gently pushing the bit into the cuticle to exfoliate dead skin. Use the e-file in smooth passes with gentle pressure. Keep the bit parallel to the nail. 2. 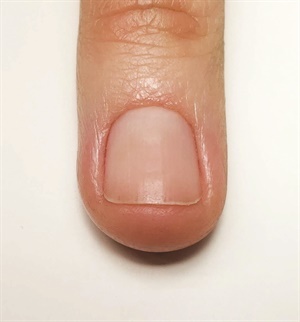 Continue filing in smooth passes at the base of the nail until the cuticle has been reduced. Use a nylon brush to remove debris. Continue filing on the right side. Avoid dragging the body of the bit through the nail groove (doing so will over-file the nail plate). Rotate the client’s hand to ensure the bit is parallel to the nail. 3. Use the full body of the Sciver to exfoliate the fingertip and callused skin near the free edge. Use Erica’s ATA Polisher bit with a drop of cuticle oil to rehydrate the skin around the nail. This will reduce hangnails. For more information, visit www.ericasata.com.